NOTE: spices/herbs in red (below) have yet to be added to this post. Also, chile peppers are discussed individually by type. Herbs/spices in red in the “Includes” list below are not complete, or have not yet been added to this post. Ginger is from the rhizome (root) of the ginger plant, and is a relative of turmeric. Its most well known health benefit is that of soothing digestive distress, especially during recovery from parasitic infections. In double-blind studies, it has been shown to be more effective than Dramamine in relieving motion sickness. Ginger is great for warming the body and flavor of foods. It has been used as a food preservative. It is high in the minerals: potassium, magnesium, copper, manganese; and in vitamins B6s: choline & folate. (1, 2) Eating a bite of ginger (or sipping on ginger tea) between bites of food will help increase the saliva in your mouth, which in turn improves your digestion. has anti-inflammatory properties (from the gingerols) as documented in a placebo-controlled, double-blind crossover study. See also Mercola’s article on Ginger that focuses on its ability to help people with metabolic syndrome (insulin resistance) and obesity, but also addresses other benefits of ginger. It also includes a recipe for “Fire Tea,” a concoction made with ginger and cinnamon. (1d). See also my recipe for Golden Milk using turmeric and ginger. You can use the fresh root – grated, minced or chopped – in some recipes, or as a ground powder in other recipes. To make your own powder from the fresh root, you first need to dehydrate it before grinding. ‘See Fresh Bite’s Daily blog (31) or Mom with a Prep blog (32) for details. This is adapted from The Spruce (36), and makes 1 mug of ginger tea. Peel ginger root, then slice thinly to maximize surface area for the best flavor in your tea. Add it to water in a saucepan; bring to a boil and boil for 10 minutes or more. For a stronger tea, use more sliced ginger and boil 20 minutes. Wash pieces well, peel (potato peeler works great), and slice about ⅛” thick crosswise, then cut each slice into cubes. Place on a baking sheet to dry in a warm room or in the sun for several days (check daily), or on a drying rack to dry in a dehydrator, 1 – 3 hours at 95°F. I use a framed screen placed in my natural gas pilot-warmed oven. 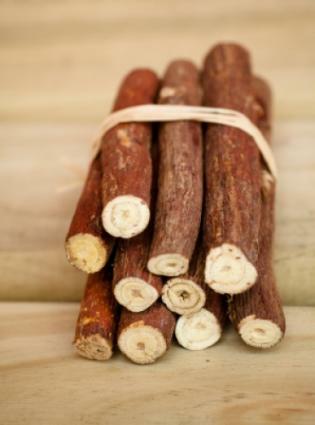 Licorice root is a sweetener, flavoring agent, and has medicinal properties. It’s flavor is similar to fennel or anise seeds; you probably have had it as black licorice candy, for which it provides both the sweetening and flavor. Its flavor and sweetening ability, as well as some of its medicinal properties result from glycyrrhizin (a triterpenoid) in the root. Licorice is best known for treating gastric issues such as ulcers, diverticulitis, leaky gut, and constipation. It has an “antispasmodic aspect … that aids in reducing symptoms associated with irritable bowel syndrome and Crohn’s disease.” (15). It is useful in treating inflammation in the gut, and also in helping to heal the gut lining. Deglycyrrhizinated licorice (also known as Dgl) is available with the glycyrrhizin removed, for treatment of gastric issues, if you wish to avoid its side effects. Licorice tea is soothing for a sore throat, bronchitis and other respiratory symptoms. It is a natural cough suppressant. Although Dgl licorice can also be used for treatment of respiratory issues, whole licorice is preferred. 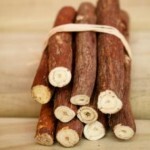 Licorice root is also an adaptogen used to treat adrenal fatigue. You need the whole root (best taken as a tea) for this use, as the glycyrrhizin is the active agent. 1.75 – 5.25 g (0.06 – 0.19 ounces or 1 – 2 tsp) per day is recommended dosage of the whole root. (16) However, beware of side effects from extended use of whole root (see Caution below). Unfortunately Dgl licorice is not helpful for adrenal fatigue. The easiest way to take the whole root is as a tea. Place 1 – 2 tsp of the chopped root in a sauce pan; add 3 – 4 cups filtered water. Bring to a boil over medium-high heat, then reduce to a simmer for 20 – 30 minutes. Strain and take in ½ – 1 cup increments. Glycyrrhizin in licorice root has important side effects. It can raise blood pressure, and cause heart arrhythmia. It is best not to take it more than 2 weeks at a time, and monitor your blood pressure before starting and daily while taking it. Perhaps one of the oldest known spices, mustard is mentioned many times in the Bible and has a long history for use in medicine. A member of the brassica (cabbage) family, it is a very rich source of the minerals selenium, phosphorus, manganese and magnesium (2 tsp provides more than 5% of minimum daily value), and a rich source of iron, calcium and zinc. It also provides protein, especially including the amino acid tryptophan; omega-3 fatty acid, fiber, and vitamin B3 (2). When using dry (powdered) mustard, which does not have a strong flavor, you can enhance its pungency and heat by mixing it with water to initiate an enzymatic process that releases mustard oil. Adding hot water or an acidic substance, such as vinegar, stops the enzymatic process (2). If you have thyroid problems, especially hypothyroidism, you might want to avoid mustard (as well as other cruciferous vegetables, especially when raw), because of the goitrogens common to this family. Goitrogens suppress thyroid activity by inhibiting the incorporation of iodine into the thyroid hormones; however, cooking them diminishes goitrogenic activity (2). (Image, right, from Wikimedia Commons); NOTE: I’m working on an update to address health benefits in more detail. They resemble the mint family in look, but mint varieties do not sting and are more aromatic than nettles. Harvest while young, before they flower; ‘always leave a few leaves below the cutting so that plant will continue to grow’ (26). Blanching them (2 minutes in boiling water, then drain) neutralizes the stinging aspect of the plant. Save the blanching water to use as a veggie broth for soups, or to drink as nettle tea. 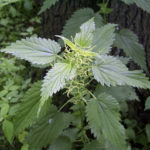 Nettles can also be dried and reconstituted for use in recipes, but the stems may be a bit tough. Nutmeg is commonly associated with sweet treats sweet treats like cookies and spice cakes, as a sprinkling on egg custard or egg nog. But it is also commonly used in many savory main dishes as well; for example, my recipe for Moussaka (Greek Lamb & Eggplant Casserole) (4). 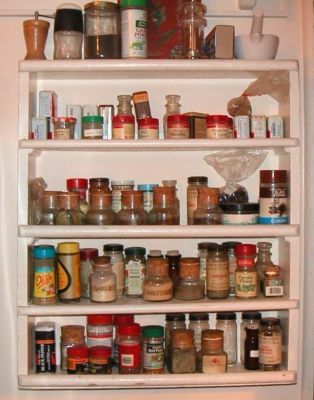 One whole nutmeg, grated, is equal to 2 – 3 teaspoons of ground nutmeg (5). It is rich in the mineral magnesium, which is important for relaxing muscles. Its antioxidants myristicin and elemicin fight inflammation and pain. it may also be useful for slowing down certain aspects of aging by slowing the deterioration or neural pathways int he brain. slow down the deterioration of neural pathways in the brain. enhance the flavors of creamy sweet treats (cream pies, puddings, custards, ice cream and soufflés), as well as cookies, cakes and pastries. topping beverages like eggnog, cappuccino foam, milkshakes; also wine and punch. savory dishes including cheese sauces, soups, gravies; vegetables such as cabbage family and other greens, onions, eggplant, green beans, potatoes, and winter squash. This herb is closely related to marjoram; they can be substituted for each other in most recipes. One of my favorite herbs, oregano has a “warm, pronounced flavor, with sweet and aromatic undertones.” (14) I grow it in my garden to use mainly in Greek, Italian and other Mediterranean recipes, but it is also popular in Mexican cuisine. It can be added during cooking, rather than at the last moment before serving as many other herbs, although it is still best to add it toward the end of the cooking period. You can chop the leaves, or use the whole sprig, then remove and discard the stem before serving. If you use olive oil for dipping breads, etc., try infusing your oil with oregano. Paprika is from a red pepper grown in areas around the Mediterranean, but the best is grown in Hungary. Paprika varies in color from a light golden orange to a deep rusty red, and releases its color and flavor only when heated. It is a moderately warm spice; the orange colored paprika carries more heat than the dark red varieties. It deteriorates quickly; buy in small quantities and store in a cool, dark place for no more than 6 months. In cooking, it tends to lose color and flavor the longer it is heated, so it is best to add it near the end of the cooking process. Simply sprinkling it on foods as a garnish does not impart its flavor. To flavor foods, mix it with a bit of oil or heat it with the food. Like all peppers, paprika is rich in vitamin C. Paprika has 5 – 6 times more vitamin C than oranges, lemons or tomatoes. Sun-dried paprika has a higher vitamin content than commercially dried versions, because the vitamins are heat-sensitive. Red peppers such as paprika are also rich in vitamin-A (beta-carotene) which promotes cell growth and recovery, which in turn supports anti-aging. Vitamin E is another important vitamin that together with vitamin A fight free-radical damage. It is used as an antibacterial agent and stimulant. It can help normalize blood pressure, improve circulation and increase production of saliva and stomach acids to aid digestion (6). This section not yet completed. This wonderful herb is more than a green accent on your dinner plate; it has amazing health benefits (see below), many of which are due to the abundance of chlorophyl in the leaves and stems. Studies reveal that the effects of parsley leaf and its stem extracts significantly reduce the ability of cancer cells to migrate and metastasize. When compared to 47 other fresh plants with cancer prevention properties, parsley was one of the top four herbs revealed to have the highest inhibitory effects on cancer-inducing inflammatory compounds (such as nitric oxide). If you do veggie-juicing or make a protein smoothie, try adding parsley leaves and stems to your daily beverage. See also ” Thyme & Rosemary” below. “Rosemary and thyme…work just as fabulously in desserts [as in roasted meats and sauces]: creamy custards, buttery cookies, pies, crisps and cobblers made with fall fruit such as apples and pears. In my experience, these herbs work wonderfully with goodies that contain lemon juice and/or zest. This is one of my favorite herbs, and I grow it in my garden (the French Tarragon variety, which has the most flavor). It has a bit of licorice flavor (like anise or fennel) that lends a wonderful flavor to sauces like hollandaise or mayonnaise. It is a member of the artemisia genus (same as absinthe, infamous for absinthe liquor, vermouth wine, and wormwood), and is an essential herb in French cuisine. Along with parsley, chervil and chives, it is a component of fines herbs. It is at its best in chicken, fish and egg dishes. Fresh tarragon leaves and stems can be dried for storage (its best to cut up the stems into short segments). Another way to preserve its flavor is to steep it in vinegar (22): use 1 cup of bruised, fresh tarragon sprigs to 2 cups white wine vinegar; cover and store in a cool dark place for 2 – 3 weeks before using. A rich source of vitamins C, A, and B-complex group of vitamins such as folates, pyridoxine, niacin, riboflavin, etc. Like most green leafy vegetables, it is an excellent source of minerals like calcium, manganese, iron, magnesium, copper, potassium, and zinc. To get maximum benefit of these minerals, the tarragon should be cooked with oil, such as in sauces that include butter or olive oil, or in vinaigrette salad dressings. It has many health benefits and is used in folk remedies (23, 24). Most varieties of tarragon have anti-oxidant properties in its oil. Chewing tarragon can numb the mouth and is thus useful for toothaches; it contains the same eugenol component found in clove oil – another home remedy for toothache. It is useful as a digestive tonic (to relieve upset stomach, irritable bowels and dyspepsia) because it aids in the production of bile by the liver. Like most members of the artemisia family of herbs (including wormwood), it is useful for treatment of intestinal worms. It may also help with anxiety and stress, and promoting a good night’s sleep. Thyme, a woody and aromatic herb, is the most-oft used herb in my kitchen; I grow it in my garden, but it is also a great ground cover that survives being stepped on, and is used between stones in a walking path. It is used throughout the Mediterranean, where it originated. See also Mercola’s article on Thyme (1g). However, it isn’t just used in savory foods, but also sweet treats (see also “Rosemary & Thyme,” above). See also Dr. Mercola’s excellent article on turmeric: How this spice can potentially improve your health (1e). He also has an article about turmeric’s major component, curcumin, with cautions to take to have better absorption of turmeric’s major component – especially recommends sustained release supplements (1f). Turmeric is in the same family as ginger, and like ginger, it is the rhizome (root) that is used in cooking and medicinally. The best source of turmeric is from fresh root. It resembles ginger, but has a warmer, golden-orange color. Dr Mercola recommends purchasing organic supplements of turmeric (7), but I think we should keep supplements to a minimum, and prefer to get my spices by cooking with them. However, I do agree with his admonition to use only organically grown herbs and spices. It is great in beverages such as Golden Milk (Turmeric Tea) that I drink before bed, or Mercola’s Ginger-Turmeric Latte (33), both delicious ways to add turmeric to your daily regimen. as an anti-inflammatory agent, especially for relief from arthritis. All of these can be attributed to turmeric’s antioxidant, anti-tumor, anti-inflammatory, and antibacterial properties. In Oriental medicine, it has been used as a stomach tonic and blood purifier, and to treat a variety of skin conditions (probably by acting as a liver tonic) and minor injuries (2, 10). Turmeric includes curcuminoids, substances with amazing anti-oxidant properties. The most abundant curcuminoid in turmeric is curcumin, which promotes liver and gallbladder health. It induces flow of bile, which breaks down fats; and has been used as an external antibiotic to prevent infection of wounds. Curcumin, a component of turmeric, also promotes healthy skeletal tissue and digestive system; and also protects arteries. Other extracts inhibit gastric secretion and protect against injury by certain drugs (such as reserpine) (7, 10). However, I believe the whole spice is more effective than its individual components (‘the whole is greater than the sum of its parts’) because of synergy in the whole. Curcumin and brain health: NEW (Oct 9, 2016): There have been many studies on the healthfulness of turmeric and its biochemical components; now a recent study by the National Institutes of Health (NIH), “Curcumin boosts DHA in the brain: Implications for the prevention of anxiety disorders” (29), shows the importance of turmeric may hold for vegetarians and non-vegetarians when it comes to the health of the brain. DHA is an Omega-3 fatty acid – and the most prevalent omega 3 fatty acid in brain tissue. It has long believed could not be made in any significant quantity by humans, and must be obtained from other animal sources, primarily fish. Gene modulation is another action of curcumin in turmeric, which has potential to delay dementia, and improve brain function of these already suffering from dementia, and shows promise in treatment of cystic fibrosis (2, 8). Mercola on Turmeric: (33a) articles.mercola.com/herbs-spices/turmeric.aspx; (33b) https://products.mercola.com/curcumin-supplement; see also (1e) above. This entry was posted in Herbs, Medicinal, Spices and tagged ginger, herb, mace, mustard, nettle, nutmeg, paprika, parsley, rosemary, sage, spice, tarragon, thyme, turmeric. Bookmark the permalink.